Comfortable and fashionable messenger bag. OVERALL DIMENSIONS: 12.5" to 12". The size of the image printed is 10" to 11". This shoulder is very sturdy and features 3 useful compartments with zippers + 1 zippered compartment inside the bag. Front compartment is secured with adhesive hook and loop. The main color of the bag is beige. It has an adjustable shoulder strap which can be adjusted up to 25 inches. This casual bag can be used as a school bag, diaper bag, beach bag, gym bag. No limits! This bag will be your new favorite thing! Take it where ever you want. Use it for work, school, short trips, carrying books, for college. No limits! Made from superior polyester fabric, it's durable and long lasting, also light and compact for your comfortable wear. With the widest range of prints you'll find anywhere, you are sure to find the right design for that special person! 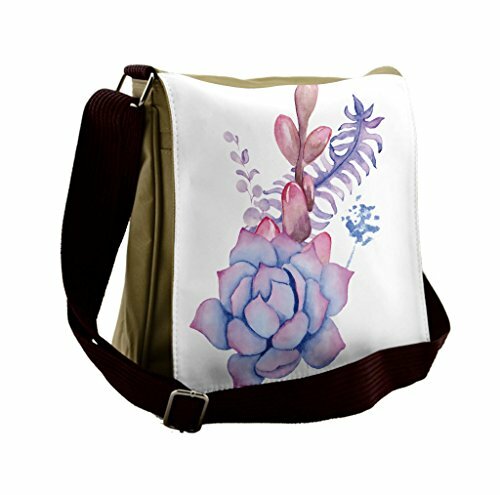 Our messenger bag designs are professionally printed, so your unique design will look great and make someone smile with the funny, cute, vintage, or expressive artwork. Customized, personalized products are very popular. As manufacturers of digital printed products, we follow current trends and bring you the latest hot fashion products. Either a gift to your family or friend, father, mother, daughter, son, boyfriend girlfriend, best friend, niece, nephew, or to yourself, the item should be interesting and authentic. Environmentally friendly, no dye substance harming health of your family. Colors won't fade thanks to new digital printing methods. The digital images we display have the most accurate color possible, however due to differences in computer monitors, we cannot be responsible for variations in color between the actual product and your screen. FEATURES: 10" x 11" printed flap area. 3 zippered compartments plus 1 zippered interior compartment. MATERIAL: High quality polyester material. Adjustable shoulder strap up to 25". Sturdy and durable. EASY TO USE: Keep organized and don't lose your important belongings. Unisex. Multi-purpose bag.